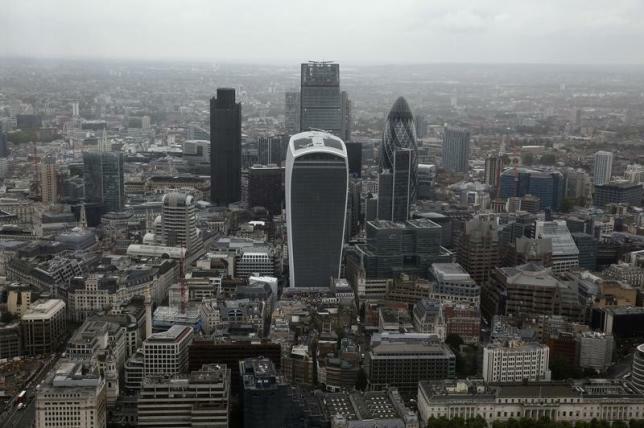 LONDON – Britain’s economy grew more strongly than previously thought in the first three months of the year, and households’ disposable income rose at the fastest annual pace since 2001. The economy grew 0.4 percent in the first quarter, the Office for National Statistics said on Tuesday, revising up from an initial estimate of 0.3 percent which the Bank of England and most other economists had thought too gloomy. The ONS also revised up growth in year-on-year terms to 2.9 from 2.5 percent, a much stronger increase than economists had expected. For 2014 as a whole, growth was revised up to 3.0 percent, its fastest rate since 2006. The first-quarter growth rate was roughly half that seen in the last six months of 2014, but most economists and the Bank of England expect growth to pick up later this year. Britain’s current account deficit also fell to 26.548 billion pounds from an upwardly revised 28.93 billion pounds, still much higher than expected and equivalent to 5.8 percent of GDP. Figures for 2014 as a whole were also revised up to show a deficit of 5.9 percent, the biggest since records began in 1948. ONS figures showed that net trade acted as a drag of 0.6 percent on GDP in the first three months of 2015. Household spending was the biggest driver, and the ONS also reported upward revisions to earlier estimates of business investment. The upward revision to GDP will not have been a surprise to most economists as previous figures from the ONS had shown upward revisions to industrial output and construction. “The slight upward revision to growth in the first quarter of 2015 is down largely to the recently announced new methods to measure construction output,” ONS Chief Economist Joe Grice said. Quarterly growth in services output was left unrevised at 0.4 percent.